I'm loving the limited-time Blended Seasons Bundle! It's so versatile, not only because it covers all the seasons of the year, but because the images are perfect for all kinds of coloring techniques! Today, I'm bringing back a fun White Wash Watercolor technique with this featured set to try out the new Watercolor Pencils Assortment #2. I've created a quick video to help you try the technique on your own and a project sheet that you can print out for reference. 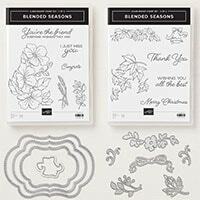 From Watercolor Pencils to Stampin' Blends, ink pads to Stampin' Write Markers, there are many fun ways to color in the images in the Blended Seasons stamp set. I decided to take it up a notch and bring back a Too Cool technique that I hadn't tried in awhile—White Washed Watercolor! The technique allows you to color with Watercolor Pencils on a dark background for a subtle, painted look. It looks great on lighter colors, too! Try it! Background Basics—I stamped the floral Blended Seasons image in VersaMark ink along the bottom of a vertically folded Highland Heather card base. I die-cut a Whisper White faux-stitched label shape using the largest die-cut from the coordinating Stitched Seasons Framelits. It's adhered to the card front with SNAIL. 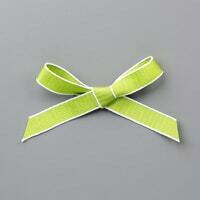 Next, I wrapped a Granny Apple Green Texture Weave Ribbon around the card front and tied it into a double-knot. Watercolor Floral—I stamped the same floral image in VersaMark clear ink onto a 3-1/2" x 4-1/2" piece of Gorgeous Grape cardstock, then sprinkled it with Copper Embossing Powder and heat-set it with a Heat Tool until glossy & smooth. I colored the image with White Craft Ink applied with an Aqua Painter to create a semi-opaque foundation for the color. After that was completely dry, I colored each area with a dry Watercolor Pencil, just laying down color in each area without fully coloring to the lines. Then, I used the Aqua Painter to blend the color and paint it to the lines. If you want, you can wait for that to dry, then add more layers of colors and shading. I used Flirty Flamingo, Cherry Cobbler, Gorgeous Grape, Balmy Blue, Granny Apple Green and Garden Green colors, all new to the #2 Assortment, for this image. Play with the colors for different looks! I wiped the image with a tissue to remove any residual color from the shiny copper embossing. I popped up the label with Dimensionals over the ribbon. Finishing Touches—I embossed the Blended Seasons sentiment in Copper Embossing Powder onto a 2-1/4" x 3/4" piece of Whisper White, then fish-tailed the end before attaching it to the focal point with SNAIL adhesive. I finished by adding a couple of Gorgeous Grape Glitter Enamel Dots. Two Cool—My second version starts with a Petal Pink card base, and I used Petal Pink ink to stamp the flowers on the background. 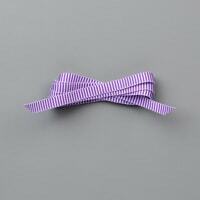 I also wrapped some Gorgeous Grape Mini Striped Ribbon around the card front. 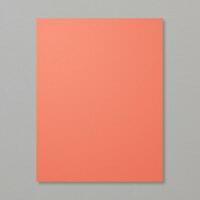 Focal Point—This time, I tried Calypso Coral for the focal point background, embossing in the same Copper color. I colored with a combination of Watercolor Pencils from the original set and new assortment: Melon Mambo, Coastal Cabana, Granny Apple Green, Gorgeous Grape and Balmy Blue. Finishing Touches—The greeting was stamped in Gorgeous Grape onto Whisper White, then die-cut with the Stitched Shapes Framelits, which goes perfectly with its faux-stitching! See this technique in action: White Washed Watercolor Technique Video. Which White Wash Card Do You Like Best? On this week's Project Sheets Friday, I'm sharing two cards by fellow stamping demonstrators featuring Two Cool techniques—embedded embossing & bleach stamping! It's been awhile since I've done either technique, but every time I try them, I fall in love with them all over again! Print out the instructions and try them for yourself! You never know what color you'll end up with with you stamp an image in bleach. 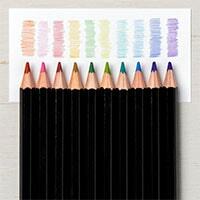 Depending on the card stock's original color, you could get a lighter shade or a color that's completely different. It's fun to experiment! I love the results on this card by France Martin, and I especially like the way she added dots of bleach around the lady's foot to look like she's splashing the water! Too Cool! Fold a paper towel into quarters, place onto a plate and pour bleach over the paper towel. *make sure the bleach gets saturates the paper towels without overflowing. 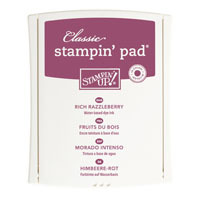 Tap your stamp into the bleach and stamp onto 3-3/4” x 3-1/4” Rich Razzleberry card stock ***rinse the stamp under running water until bleach removed. Mat onto a 4” x 3-1/2” layer of Basic Black card stock. Add a little bleach into your Aqua Painter, then use the brush tip to add a little drop of splash by the lady’s foot. *Thoroughly rinse the Aqua Painter. Once thoroughly dry, stamp the Beautiful You greeting in Rich Razzleberry ink near the stamped image. 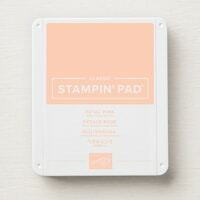 Randomly stamp the Timeless Textures image with Blushing Bride ink onto the Blushing Bride card base for background. Emboss 1” x 4-1/4” strip of Rich Razzleberry with Boho Chic folder. Adhere all layers onto the card. I love the look of these "quilted" layers for a beautifully textured and colorful background! 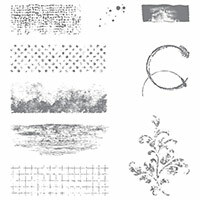 This technique works best with embossing folders that have texture throughout the whole folder, rather than sparsely textured. Try it with different folders, as well as different punched and die-cut shapes! Punch out a set of 1-1/4” circles and 1” circles: one each in Dapper Denim, Flirty Flamingo & Mint Macaron. 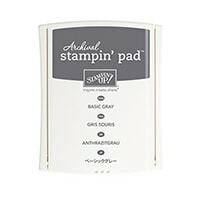 Adhere circles to Basic Gray cardstock with SNAIL Adhesive. Trim circles to match the edge of the cardstock. 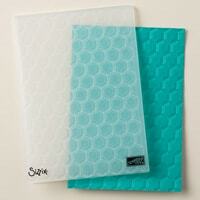 Run Basic Gray cardstock through the Big Shot using the Hexagons Embossing Folder. Adhere the Basic Gray layer to the Dapper Denim card base. 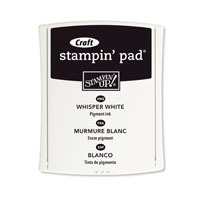 Run the Whisper White cardstock through the Big Shot with the Celebrations Duo Embossing Folder. Stamp the embossed word with Happy Celebrations splotches in Flirty Flamingo, Mint Macaron & Dapper Denim to highlight the word. Stamp “Let’s” in Basic Gray. Trim the edge into a fishtail banner shape with Paper Snips. Pop with Dimensionals. 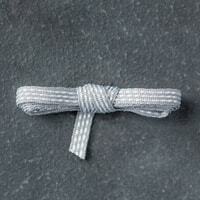 Adhere a Smoky Slate 1/8” Stitched Ribbon bow with a Glue Dot. I still have spaces left for tomorrow's Stamper Sampler Class featuring the Bag In A Box Handbag and I'd love to have you join us! Please RSVP by 5pm today if you'd like to attend. 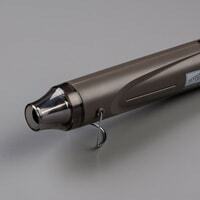 If you can't make it, register for a Class-To-Go kit by next Wednesday, May 27. Today, I'm sharing the details of our Stamper Sampler Handbag project. But first, don't miss this week's Weekly Deals! 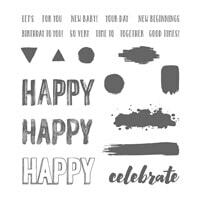 There are some awesome discounts on Birthday Bash Designer Series Paper, Chalkboard Paper, Stacked With Love DSP & Washi Tapes, and more! Prices are good thru Monday, May 25, 2015. Today, let's take a closer look at tomorrow's Bag In A Box Handbag & Notes class! You are going to love creating this adorable gift set! Remember, if you can't make the class, be sure to sign up for the Class-To-Go kit by next Wednesday, May 27. 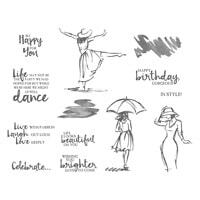 If you search the internet for stamping ideas, then you've no doubt stumbled across this adorable little note card set, originally created by Crafty Hallett. My class projects feature the beautiful and soon-to-retire Back To Black Designer Series Paper along with the Petal Potpourri stamp set, which is also only available thru June 2. Handbag Assembly—The bag in a box is pretty easy to assemble. Crafty Hallett has a complete Bag In A Box Handbag video tutorial, but I've outlined the basic steps below. Start with a 5-1/4" x 2-1/2" piece of card stock in the accent color. Score at the 1/2" mark on all four sides with the Simply Scored tool. Create corner tabs by snipping along the score lines along the top and bottom sides with Paper Snips. Fold up the sides and adhere the corners to the outside of the box with Sticky Strip. Start with a 12" x 3-1/2" piece of Back To Black DSP. Add Sticky Strip along the 12" bottom and one side of the side you'll use for the inside of the bag. Adhere a 12" x 1/2" strip of accent card stock along the top of the outside of the DSP with Sticky Strip. Peel the Sticky Strip backing off the bottom inside and adhere the DSP around the box bottom. Adhere another 12" x 1/2" piece of card stock trim along the outside bottom of the bag. Cut 3/8" x 8" strips of the accent card stock. Position one end of the handle about 1" from the side of the handbag and poke a hole through the handle and the bag trim with a Paper Piercing Tool. Secure with a Silver Mini Brad. Repeat with the other end of the strip about 1" in from the other side of the bag. Repeat on the opposite side of the bag. Adhere a 12" x 1/2" accent strip of card stock along the inside top of the bag to cover the brad backs and give it a sturdy, finished look. Class participants will be able to choose from either the Coastal Cabana or Cherry Cobbler color schemes for their class project. Monogram Medallion—Each bag is personalized with a simple monogram stamped with the Metro Type Alphabet set. I stamped the letter in Memento Tuxedo Black ink onto Whisper White, then punched it with the 1-1/4" Scallop Circle Punch. It's mounted on two Flower Medallion punched shapes from coordinating colors. I curled the petals with a Bone Folder and stacked the layers with Dimensionals. The handbag holds four 4" x 4" note cards with matching envelopes. Note Card Background—The cards are created with 8" x 4" Coastal Cabana color card stock, folded to 4" x 4". I stamped the 2-1/2" x 4" piece of Whisper White with various sentiments from Butterfly Basics, Painted Petals and Yippee Skippee stamp sets. Then, I added a 1" x 4" strip of Back To Black DSP accent next to the white panel. Note Card Flowers—I stamped the Petal Potpourri images in Coastal Cabana, then punched them out with the coordinating Flower Medallion Punch. 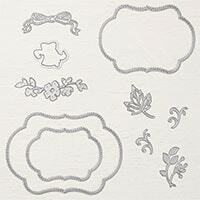 The flower centers are from the same set, then punched with the 7/8" Scallop Circle Punch. I added Dimensionals under the flower for one accent, and under the flower center for the other, just to add interest. I finished each with a Pearl Jewel. 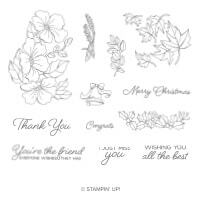 Bundle It & Save—Purchase the Petal Potpourri stamp set and Flower Medallion Punch together in the Petal Potpourri Bundle and save 15% over the cost of purchasing them separately. Two Cool—Here's a closer look at the Cherry Cobbler version. I like the medallion in the center. And, here's the whole ensemble in Cherry Cobbler. Love this classic color combination and so far, it's been the popular choice for my class attendees! Matching Envelopes—I created a matching handmade envelope for each of the note cards with the same pattern of Back To Black DSP that I used on the card. 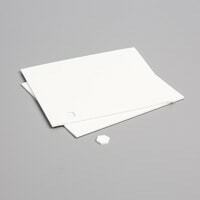 It's easy to make the perfect size envelope with the Envelope Punch Board. I just followed the directions on the board to create an envelope for a 4" square card starting with a 6-7/8" square piece of DSP. The Back To Black DSP patterns will vary for each of the class kits. Contact Me To Attend The Bag In A Box Handbag Class! CLASS: "Last Thursdays" Card Class—February 26. RSVP by February 25. A big shout out to everyone who attended my Fun Folds & Amazing Accents class this week! They were such fun cards to make! It was one of my most popular Class-To-Go kits so far and the kits are in the mail for those participants, by the way. Thank you! Today, I'm sharing the final project from the class and it's definitely a FUN fold! This awesome card style not only swings and flips, it also has a pop-out on the inside! Too Cool! It's sure to delight the recipient! Card Assembly Basics #1—I started with a standard 5-1/2' x 8-1/2" Rose Red card base and used the Square Collection Framelits to die-cut a window on the card front. Card Assembly Basics #2—Next, I cut a 6" x 5-1/4" Whisper White piece and scored it along the 6" side at 2" and 4". I folded it accordion-style and situated it so the last two panels open like a traditional card. After stamping that last panel (we'll get to those details later), I adhered it to the outer edge of the card's inside. TIP: Make sure you have your inside positioned correctly before adhering. When the last panel is flat against the card, the adjacent panel to the left should be folded up toward you, not away from you. Follow the photo above. Card Assembly Basics #3—Next, fold the accordion flat, close the cover and add Fast Fuse Adhesive to the part of the Whisper White that is showing through the window. Die-cut a Pear Pizzazz square with the same size Square Collections Framelit and position it through the window. This what it should look like when you open it. I didn't like that the swinging panel was hanging free and not automatically opening when I opened the card. I needed "idiot-proof!" So, I added one more little piece that made all the difference! Helpful Hinge—I cut a 2" x 1/2" piece of Whisper White and scored it in half on the 1" mark. Then I added some Fast Fuse Adhesive to the "mountain" side of the fold. I folded out the left panel and adhered the hinge to the edge, flush with the score line on the hinge. Fold the last panel back into place, so the adhesive on the other half of the hinge is now showing. Then, simply close the card and the hinge will catch the back of the card front. Now the card should pop out and swing around automatically! Sweet! Here's an up-close of how it should look when it's all decorated! Sheltering Tree Stamping—I stamped the Pear Pizzazz ground on the bottom of a 3" x 3" piece of Whisper White. The tree is stamped in Early Espresso with Blushing Bride flowers on the tree. Along the ground, I stamped flower stems in Pear Pizzazz and added Rose Red and Blushing Bride blooms on top. And, I finished off the two-step bicycle in Early Espresso with a Rose Red frame. I added a matching bike on the inside. Sweet Sentiment—I finished by stamping a sentiment from Sheltering Tree in Early Espresso ink onto a 1/2" strip of Whisper White. It's trimmed with fish-tail ends and popped up with Dimensionals. Two Cool—Since I was die-cutting the same size squares from two different colors, I made two cards in opposite color combinations to be efficient! I love how this one turned out with some minor changes in stamping elements and colors. I added Pear Pizzazz leaves to the tree this time and hung a swing from its branches. The ground is covered with wildflowers. The inside has a tiny field of flowers, too! This sentiment was a little longer, so I positioned it flush to the card's edge and fish-tailed only one end. You've got to try this super-fun card! CLASS: "Last Thursdays" Monthly Card Class—October 30. I've been experimenting with a new project idea that is definitely Too Cool! For today's Sunday Showcase I'll show you some fun variations that I think will inspire you! "Last Thursdays" Card Class—Coming up Thursday, October 30! Create these 4 cards for only $10 OR the class is FREE with a minimum purchase at the class. Class is at 6:30pm in Fort Wayne, IN. Beginner's are welcome! Class-To-Go Kits are available. RSVP by Wednesday, October 29. I'll have complete details on tomorrow's post. Sunday Showcase—Card Hanger Gift Bags! I recently was introduced to a fun and functional idea to use when giving gifts in gift bags and I thought it was brilliant! Lisa Curcio showed us how to create gift bags with a card hanger on front! See the Bright & Beautiful With Gold Accents Card for card details. No More Lost Cards! You know how easily your beautiful hand-made card can get lost in the tissue of a gift bag? Well this is a fun way to not only keep them from getting lost, but to give them the spotlight! Easy Décor For Plain Gift Bags! I like to purchase inexpensive plain gift bags with the intention of decorating them with my stamping handiwork. But often times, I'm throwing together the gift bag at the last minute and don't have time to decorate it properly. Card hangers are a fast and easy way to give your bags personality by using the card you've already created to go with the gift! For Horizontal: cut a 6-3/4" x 2" piece of coordinating card stock. For Vertical: cut a 5-1/" x 2" piece. 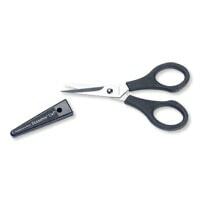 Slide the center of the long side of the card stock into the Word Window Punch as far as it will go and punch. 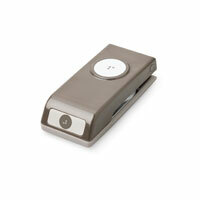 Slide the Word Window Punch over and continue punching a hole leaving about 1/2" at each end. Adhere the top of the hanger only to the gift bag, leaving the part under the hanging hole loose. Insert the back of your horizontal card. Gold Star Hanger—For my Gold Foil hanger above, I also added some decorative punching with the Confetti Stars Border Punch. Perfect coordination with my card! See Letterpress Winter Diagonal Card for card details. Hanger With Pocket—But what if your message is a little personal and you don't want everyone to read it. No problem! Simply lengthen the hanger to create a pocket! Start with a 6-3/4" x 7-1/2" piece of card stock. Punch the hanger hole with the Word Window Punch the same way. Stamp it to match your card, if desired. Adhere the top and outer edges of the bottom only. Snowflake Pocket Hanger—I decorated my hanger with more Confetti Stars punches, Letterpress Winter stamped snowflakes, and added some Silver Glimmer Paper stars punch with the Itty Bitty Accents punch pack. See the Wondrous Wreath Joy Banner Card for card details. Vertical Embossed Pocket Hanger—I tried a vertical fold card style hanger, and made the pocket a little longer so I could add some texture embossing. This one starts with a 5-1/2" x 8-1/2" piece of Cherry Cobbler. I die-cut the bottom with the Large Scallop Edgelit first, then embossed both the top and bottom with the Delicate Designs Texture Impressions Folder. Vertical Basic Pocket Hanger—For a basic vertical pocket hanger, you only need your card stock to be 5-1/2" x 7-1/2". I personalized this (for my friend Angie, not for me!) one by die-cutting with the Little Letters Thinlits. I topped it off with a Cherry Cobbler Sheer Ribbon bow. Mini Gift Bag Hanger—My friend Janet Shinn was inspired to create this adorable little mini gift bag with a hanger that fits a 3" x 3" note card! Use a 3-1/2" x 2" piece of card stock for this one! This one is decorated with the Letterpress Winter, All Is Calm DSP, Lost Lagoon Silky Taffeta Ribbon and 1/8' Silver Ribbon. So cute! What do you think? Will you be trying out one of these card hangers on your next gift bag? See Details On The April & May Spring Spectacular Classes! We'll be creating today's featured project at my Wow Techniques Class tomorrow night and I know my attendees are gonna love it as much as I do! Let me know by tonight if you are interested in joining us. You can get complete class details at my March Wow Techniques Class post. This awesome project was originally designed by Glenda Calkins at The Stamp Camp. I loved her Crisp Cantaloupe version so much that I CASEd it exactly, then made another version in Coastal Cabana. It's so, so, so pretty either way with all of the golden accents! My favorite part of these projects are that they are a card and gift all-in-one! You open the card to reveal a detachable bookmark—Too Cool! Rotary Trimmer Addition—The bookmark is made detachable with the help of the the Rotary Addition to the Stampin' Trimmer, along with the new Perforation Blade from the Spring Catalog. 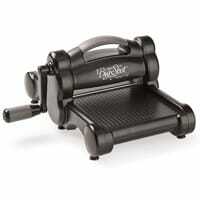 Learn more about the Rotary Trimmer in this helpful video: Stampin' Trimmer With Rotary Addition. Start with a 5-1/2" x 10-11/16" card base. Score along the long side at 4-1/4". 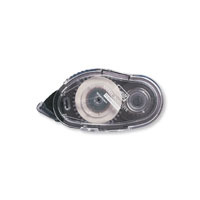 Use the Perforation Blade in the Rotary Trimmer Addition to perforate at the 8-1/2" mark. 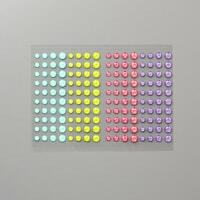 Slide the Scallop Tag Topper Punch over the top of the smallest panel, line up the edge of the punch cutting area with the perforation line, and punch. Tag Topper Focal Point—Starting with a piece of 2" x 3-3/4" Very Vanilla card stock, I punched both ends with the Scallop Tag Topper Punch. Then I stamped the Happy Watercolor sentiment and flower in Baked Brown Sugar. Color Accents—I never knew what to do with the mini splotch image from this set, but it works lovely as a Crisp Cantaloupe highlight to the word "you" in the sentiment. The larger splotch, also in Crisp Cantaloupe, is stamped off once before stamping over the bloom. Golden Glitter—The center of the flower was colored with a 2-Way Glue Pen, then sprinkled with Gold Glitter. 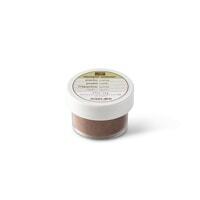 Details, Details, Details—The dotted image was stamped three times across the bottom of the element in Baked Brown Sugar ink. Then I added a few Gold Sequins with Glue Dots. Twine Ties—Both ends of the tag were threaded with Gold Baker's Twine that wraps around the embossed layer and is secured behind it with SNAIL. The twine bow is tied separately and added with a Glue Dot. Inside Details—You can choose to decorate either or both sides of the bookmark. On this version, I hid the front of the bookmark, so you have to open the card fully to see it. 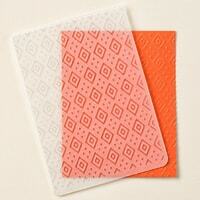 The back of the bookmark has a piece of embossed 1-3/4" x 5-1/4" Crisp Cantaloupe to match the card front. Inside & Bookmark Décor—The bookmark is decorated exactly like the front of the card. I started with a 1-3/4" x 5-1/4" piece of Very Vanilla, punched with the Scallop Tag Topper Punch. Second version, just like the first, in Coastal Cabana. This time I decorated the bookmark on the first panel you see when opening the card and I left the back blank. Bookmark Tie—When you layer the two Scallop Tag Topper panels together, it leaves just enough of a hole to thread some Crisp Cantaloupe Ruffle Stretch Trim through both tags. Tie up the ends with a piece of Gold Baker's Twine. Throwback Thursday—It's been years since I made a bookmark card like today's projects! I created this cute A Little Wiser Owl Card for my nephew back in 2010 when we had a different perforation cutting tool. So glad we have another tool to replace this handy blade! Thanks for stopping by! Have a Too Cool day! Happy Watercolor Class Kit—Only 3 Days To Register! See complete details for the Happy Watercolor Class Kit. Contact me today! I can't wait to stamp with my Wow Techniques group tonight! Today's featured project is another that we'll be making at this event! Two Cool! These colorful, drippy cards were inspired by a technique that I saw on Lyssa Zwolanek's Song of My Heart Stampers. All you need are some Refill Inks, Watercolor Paper and an Aqua Painter! Create a palette of 3-5 Refill Inker colors in an old stamp case or button container. Add water along the top third of a 3-3/4" x 5" piece of Watercolor Paper. Hold the watercolor paper on end so gravity can pull the water into riverlets. 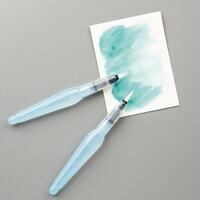 Pick up the first color with your Aqua Painter and let it drip down the edge of the paper, squeezing to add water to the color if needed. Clean off your Aqua Painter, then add the next color. Repeat for all colors. TIP: For more pleasing drip effects, you can "help" the drips along by pulling them down with the tip of your Aqua Painter. Let dry, then add to your project. Color Combo—I used So Saffron, Crisp Cantaloupe, Pink Piroeutte, Pool Party and Pistachio Pudding for my re-inker colors. I thought they turned out much darker than I thought they would. I mounted my drip-dyed paper on 4" x 5-1/4" Coastal Cabana card stock and adhere it to a Whisper White card base. Sweet Sentiment—Since the background is so lovely, I wanted something simple for the focal point, so I used the Just Sayin' phrases in Bermuda Bay, and cut them out with coordinating Word Bubble Framelits. Bundle It & Save—Purchase the Just Sayin' stamps and Word Bubbles Framelits together in the Word Bubbles Bundle and save 15%! Frilly Ribbon—The pretty Crisp Cantaloupe Ruffle Stretch Trim makes a nice texture contrast against the background. Bitty Butterfly Accent—I punched two layers with the Bitty Butterfly Punch, one in Pistachio Pudding and one in Vellum card stock. The vellum layer is adhered with a Glue Dot in the center and the wings are bent upward. Small Pearl Jewels make the butterfly body. Perfect! This technique looks great going horizontal, too! I switched to Pistachio Pudding Ruffle Ribbon and a Crisp Cantaloupe butterfly this time. I also used the same colors, just in a different order. Too Cool To Trash—Here's one more—the first one I tried—with too much water at the top and a big blob of color on the bottom. You know what, it still looks pretty cool, even with the mess-ups! What color combos would you use? Leave a comment at the bottom of the page! I decided to call an audible and change one of my Wow Techniques projects at the last minute. When I was finishing up my Tin Tile card, I realized that it was going to be much more of a Wow card once we can use the awesome new Blendabilities alcohol inks to color the tiles. So, I'm holding that one until we get those markers! It will be worth it! Instead, I thought we'd try coloring on Silver Glimmer Paper. I've done this before with sponge daubers, but I recently saw Ronda Wade coloring it a different way that was faster and turned out much better! Happy Day Glimmering Ombre Card—Learn how to easily color Silver Glimmer Paper! Two Cool! These cards were inspired by a card that Brandi Barnard presented at Leadership featuring the ombre trend. I combined her basic design with some colored Glimmer Paper and other sparkling accents to create two cool cards in two cool color combinations! Chevron Ombre Background—I simply cut 4-1/4" x 1" strips of five progressively darker shades of card stock and mounted them on a Whisper White card base. This card uses Melon Mambo, Raspberry Ripple, Rich Razzleberry, Elegant Eggplant and Night of Navy. Once all of the panels were adhered to to the card front, I stamped the entire background with the Positively Chevron stamp inked up in VersaMark for a subtle watermark pattern. TIP: Remember to stamp upside-down with big background stamps. Ink them up, set them rubber-side-up on the table, then lay the card stock on top to transfer the ink. 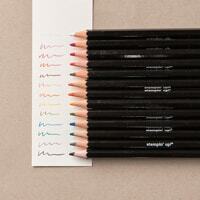 Burnish the card stock evenly, all the way to each edge for best results. Happy Day Medallion—I stamped the large circle image from the Starburst Sayings stamp set in Rich Razzleberry, then die-cut the shape with the coordinating Starburst Framelits. Bundle It & Save—Purchase the Starburst Sayings stamps and Starburst Framelits together in the Starburst Bundle and save 15%! Colored Glimmer Flower—I layered the starbust on piece of Silver Glimmer that is die-cut with the Floral Frames Framelits (one of this week's Weekly Deals, by the way), then colored with Melon Mambo ink. Details on that below. Dazzling Details—I added some Dazzling Diamonds glitter to the "happy" word with a 2-Way Glue Pen, too. Circle Accents—I stamped another starburst from the same set in Melon Mambo and die-cut them with the Starburst Framelits for another circle shape. The Basic Metal Button is threaded with some White Baker's Twine and adhered with Glue Dots for another circular element. And, did you see the cute Jewel "bubbles" floating around giving some extra sparkle and balance? I might like my blue version even better! I used Pacific Point, Tempting Turquoise, Bermuda Bay, Coastal Cabana and Pool Party for the ombre panels. The focal image is inked in Pacific Point, and the smaller starburst is in Coastal Cabana. I used Bermuda Bay ink to color the Glimmer Paper flower layer. Dazzling Dots—I don't know how well you can see it, but I used a Blender Pen to remove the ink from the dots inside the letters, then colored them with a Bermuda Bay marker. I wasn't fond of the Dazzling Diamonds, fully covered letters on the previous card (because it looked kind of sloppy! ), so I only added dots of glitter to this one. I LOVE how it turned out here! It looks like mini colored rhinestones! Place your Glimmer Paper in a tray...it's gonna get a bit messy! 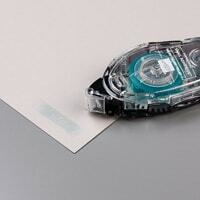 Drop a few drops of Refill Ink onto the Glimmer Paper. I'm using Bermuda Bay ink here. Use an Aqua Painter to spread the ink over the element. Once the ink is spread, let it set for a few minutes. Use a tissue to dab up the remaining ink. the ink won't stick to the actual glitter, only the paper around it, so you may be dabbing up lots of ink and water. 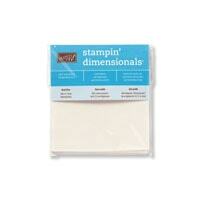 You're ready to use your colored Glimmer Paper! Which color combo do you like better? Leave a comment at the bottom of the page! Bring A Friend & Come "Wow" With Us! I'd love for you to join us at the Wow Techniques Class tomorrow night! Beginning stampers are welcome! Bring a friend and you'll both make a Bonus project! RSVP by Wednesday, February 12! Don't Miss These!—Events Dates Coming Up Soon! Welcome to a brand new week full of fantastic new stamping inspiration & activities! First, I'd like to give a great big shout to my new stamping friends from Debbie's party yesterday! It was so fun to stamping with Jan, Laura, Teresa, Amy and Dee! I look forward to stamping with you again! Woohoo! I'm Playing With The Too Cool Team Tonight! Tonight I get to hang out with my Too Cool Demo Team, and I can't wait! If you're not a Too Cool Team Member, you're missing out on a lot of fun! We share stamping ideas, business tips, try out new products & the latest techniques, and create make & takes—all for FREE! I'd love for you to be part of our family! Join by purchasing a $99 Starter Kit and during Sale-A-Bration, you can select $150 worth of products with FREE Shipping! Hobby and out-of-town stampers are always welcome! Learn more: Join My Team. RSVP by Wednesday, February 12. Contact Me Today To Register For The Happy Watercolor Class Kit! Registration for this Class-To-Go Kit closes in one week! See complete details for the Happy Watercolor Class Kit. Have you seen this cute scallop tie closure on cards? 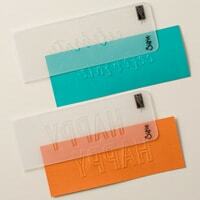 It's actually part of the card base, not just a scallop tag that's adhered to the card. 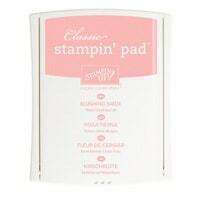 And, it's created with the Scallop Tag Topper Punch—just one more reason it's a must-have stamping tool! Cool Card Base Instructions—The card base is created from a traditional sized 5-1/2" x 8-1/2" card. Even though the Scallop Tag Topper Punch is designed to accommodate card stock that is 2" wide, you can lift up the edges of the card stock and force the whole 5-1/2" side into the punch. If you mark 1" on each side from the top, then use that as a guide, you can get the tag tops lined up nicely. Then you do some simple trimming and scoring and you're ready to decorate. It probably sounds confusing, but it's really pretty simple! See the complete instructions by from Tanya Bell at Stampin T.
Floral Print—I decorated each card front with a 2-1/4" x 5-1/4" piece of Very Vanilla, stamped with images from the Petal Parade stamp set in the Sale-A-Bration flyer. Earn it for FREE with your order of $50 from my Online Store! The large flower is stamped in Crisp Cantaloupe, the medium flower is stamped in Pool Party and the leaves are stamped in Pistachio Pudding. Perfect Sentiment—Using Bermuda Bay ink for a darker contrast, I stamped the Perfect Pennants sentiment on Very Vanilla, then die-cut it with the Apothecary Accents Framelits shape. It's popped up with Dimensionals and decorated with Pearl Jewels. Tied Closure—Once the inside was all decorated with a 1-3/4" x 5-1/4" panel of Retro Fresh Designer Series Paper, I tied the scallop toppers closed with some Very Vanilla Seam Binding. I mixed it up on this card by starting with a Crisp Cantaloupe card base and adding a panel of matching the Sale-A-Bration Sweet Sorbet DSP to the inside. This phrase is also from Perfect Pannants, stamped in Calypso Coral, and it's die-cut with the matching Banners Framelits. Bundle It & Save—Purchase the Perfect Pennants stamps and Banners Framelits together in the Perfect Pennants Bundle and save 15%! Card Inside Décor—All of the insides have a 4" x 5-1/4" piece of Very Vanilla that's stamped with each image and the patterned paper. I'm so proud of myself for taking the time to decorate the inside...I usually don't have the patience! I need to do that more often because it really finishes the card, doesn't it?! I couldn't stop with just two colors when I knew there was a pretty Pistachio Pudding pattern in the Sweet Sorbet DSP There's also one in the Pool Party floral pattern in the pack, too! If only I had remembered sooner, I would have used all Sweet Sorbet paper...well, duh! This sentiment is also from Perfect Pennants, this time inked in Bermuda Bay with a Crisp Cantaloupe circle popped up in the center. It's die-cut with the Chalk Talk Framelits. Come "Wow" With Us! I'd love for you to join us as we create this cute scallop closure card! Choose your color and your sentiment for your own custom design! Beginning stampers are welcome!